Ok, so not so much a care-free day. I'm still (always) working in overdrive mode. But, Seattle is getting some sun, and man it makes me feel good. 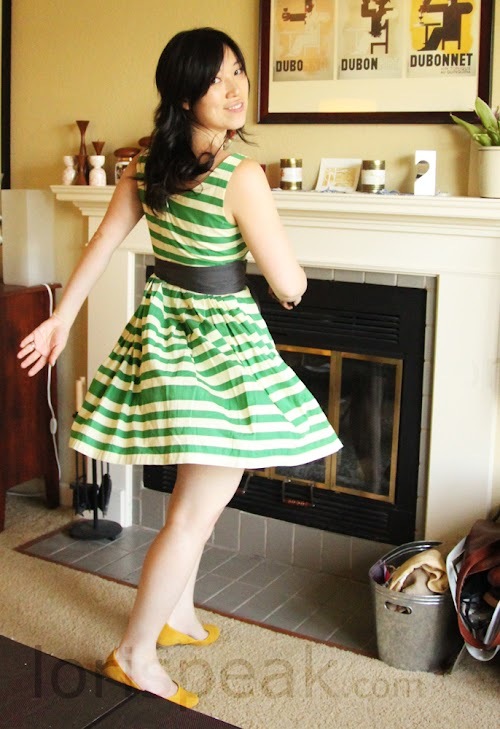 This is that wonderful Corey Lynn Calter Caranday dress I picked up from Smashion. Shout out to FrontPageFashion as an amazing seller. She shipped quickly, provided me tracking, and even packed the most beautiful crocheted butterfly doily in with my order. What I never realized from photos of this dress was the amazing color tone pairings. I LOVE that the belt is grey, not black. I love that the light stripes are cream, not white. It all gives a very vintage and relaxed air to the dress. And here's my *wink*. I love adding some extra sillyness/playfulness to an outfit. I think especially when dressing up in a town where 'dressing up' means nice jeans rather than light jeans, adding a touch of whimsy keeps a dress from feeling too stuffy. Here, the surprise is the off-beat zebra glasses necklace. I'm really such a goofball. Hope you had a lovely Tuesday! Hi Lori! I love the caranday dress on you, especially that color! (I really love most things by Corey Lyn Calter). I totally agree with you on adding a bit of whimsy to take away the stuffiness, particularly where we live! $45 for the Caranday?! That's awesome! The dress looks great on you and the necklace is a great touch! You look adorable Lori! I love it! What a cute dress! It looks great. I agree.. subtle little things like the cream instead of white and gray instead of black really make it special. That's a great necklace too, ha! So cute. You look lovely! 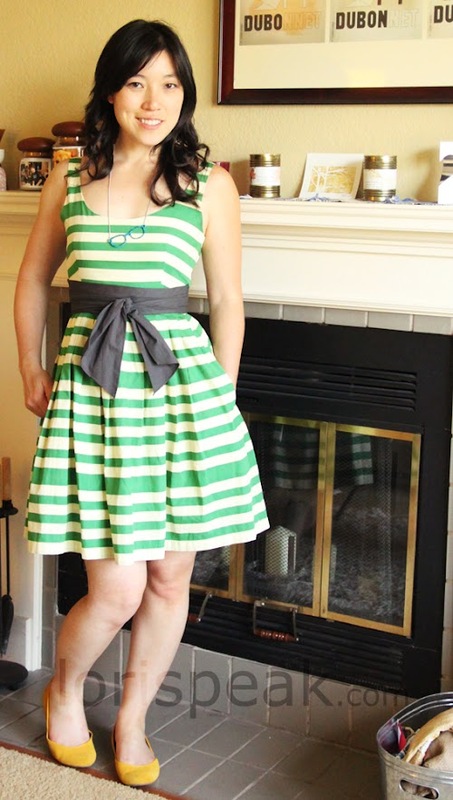 I never really cared much for the dress when I saw it on Anthro's site, but after seeing you and Kim from Anthroholic wearing this dress, I've changed my mind. The details that you like about it is what makes it unique. 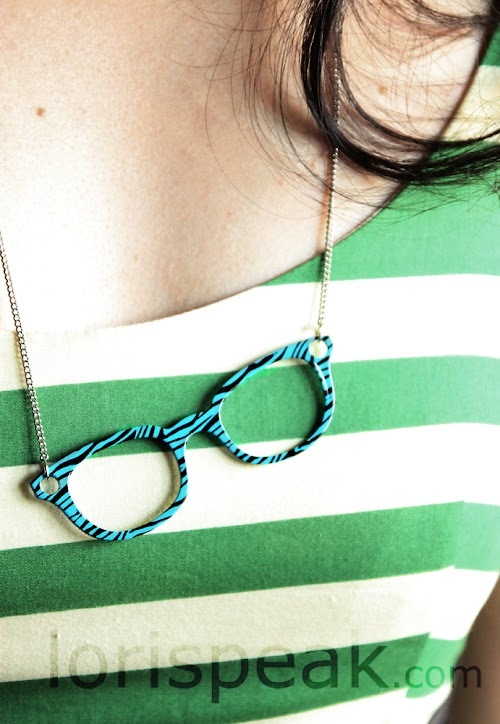 I also love the touch of whimsy with the zebra eyeglass necklace. Usually the cat calls get me angry, but that's just me. I love love love this dress. I remember seeing it on other people's blogs and was wow-ed by the two different color motifs. Your outfit is no exception. Love this dress with yellow shoes! 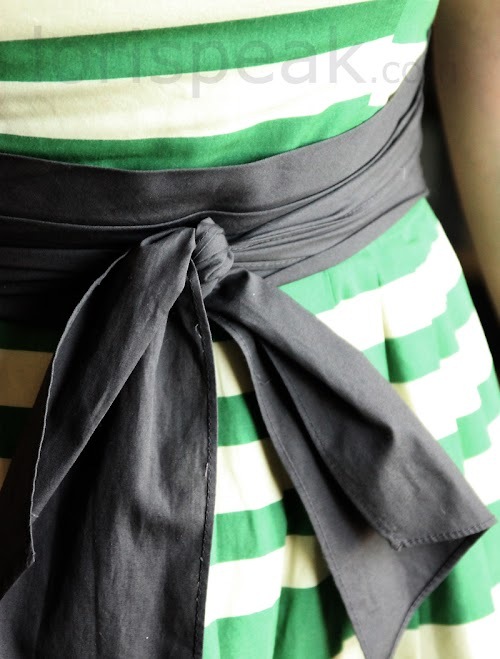 I have the Shabby Apple version of the dress so I'll have to try it sometime with yellow. Great idea!